Teena, may I do a shippy banner to this thread? Hello I made this banner but I don't know how to post here in a larger size.... Well, it's just a test 'cause I only made one banner in my life and it was for my blog So, be free to suggest all you think could be changed! its gorgeus kay! I also don't know how to post it in a larger size! On the image site there is a link "Get Linking Code"
There are a couple of thumbnail links and below that links for the full size. You could just take the one saying "direct link" and then insert it here with "insert image". It says on image shack to prefer thumbnails because of their bandwidth, so I don't know. But it's possible. Or you could use photobucket or some other image service. You could always try photobucket.com that's what I use. Kaholli, thank you so much! I did just like you said and here is the banner in a larger size! Ant thanks too to Sweetpoison and R2Roswell for always supportting my work! thanks for the fabulous banner, kay. i already added it to my post. You're welcome, it was for a good cause, after all. Finally some very nice artwork to decorate one of our favorite threads. Maybe we should do that for some of the other regular threads as well. That's really great Kay!! teena I love all those pictures, especially the "Rolling Stone" one, I have it as the wallpaper on my cellphone now! On the mini screen on the outside, I have the "Unnatural" one "Shut up Mulder, I'm playing baseball" screenshot. 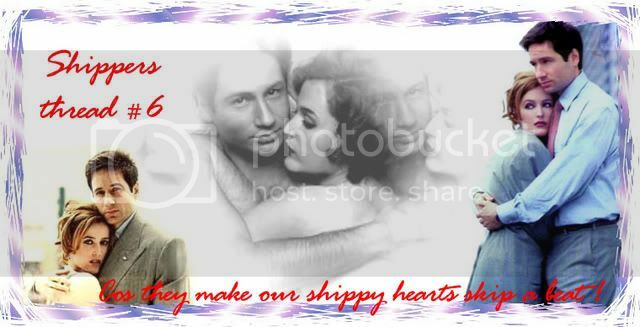 Avi by moi "I made this"
"Mulder the truth is out there but so are lies." teena thank you for starting the thread. I was just thinking, its odd but we never got much of Mulder jealous scenes(unless I am completely forgetting them). We had quite a few of them with Scully. ( Bambi, Phoebe Green, Diana Fowley). Don't remember Mulder being jealous except in Bad Blood with Sheriff Hartwell. Yes, that's true. Though I believe I might remember some time in the first season maybe? When Scully appeared to have some private life. Was it Jersey Devil, maybe? I don't remember many jealous scenes either, but then again, I haven't seen many of the epic-sodes. . I still haven't finished season 1 either, because my dad won't give it back, so I wouldn't know. Damn, that was a useless post.